Pella, the belters war ship, correctly referred to as Pella class tug boat, equipped with 4 fusion engines and a set of stacks, it can easily move large rocks between orbits, or, if needed, drop one on a planet. The radiators are retractable, so as to provide cover for them in case of a battle, and, officially for the reasons of debris encountered in planetary rings and near cracked asteroids. In retracted state, the heat is dumped into some large internal heat sinks. A secondary set of thrusters on the edges for rotation control, curiously capable of large side thrust. A gauss cannon with lead pellets, used for deceleration, at least officially. The crew area and bridge in the center, surrounded by the lead pellets for the cannon, for radiation and inertial protection. 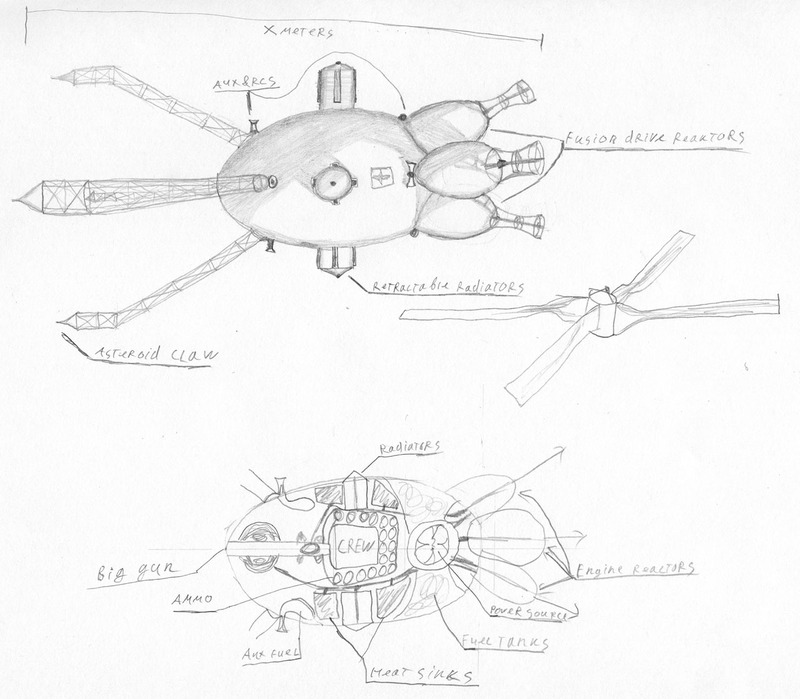 The ship designed as a symbol of possible future, where weapons and tools blend together, separated only by PR and usage.